SUCHITOTO, EL SALVADOR: In Nahuatle, informally known as Aztec language, Suchitoto means “place of birds and flowers”, a proper name for this beautiful town. 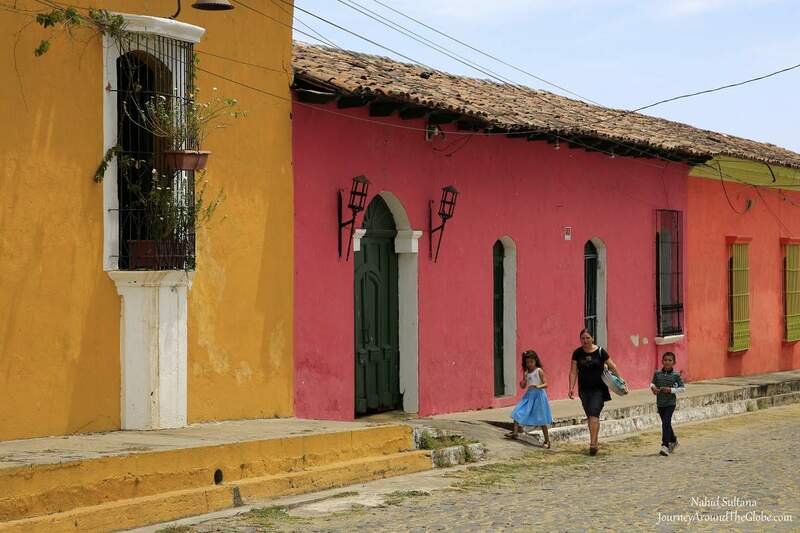 64 km from San Salvador, Suchitoto is best known for its colonial style towns and original cobbled-streets. 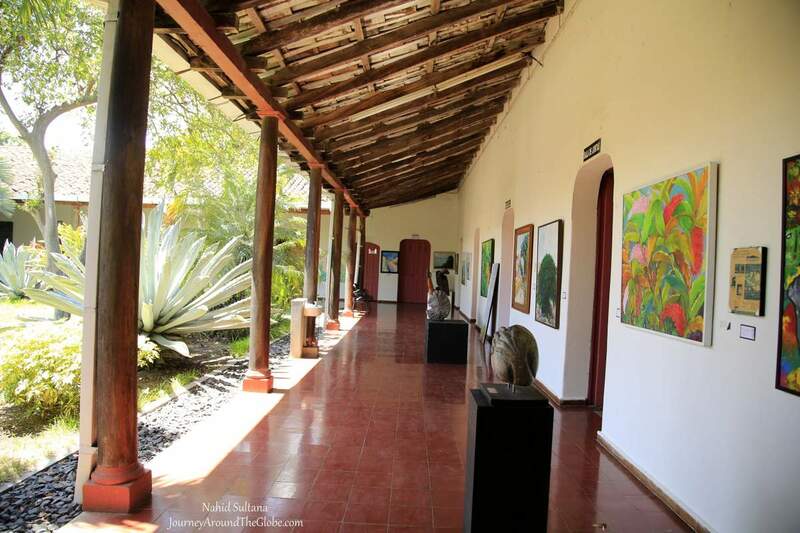 You have to step back in time when you are in the remarkable heart of Suchitoto. Historically, this town dates back to pre-Columbian times and it was already a densely populated place when the Spaniards arrived few centuries ago. The Spanish ruled this country for 400 years. But now when you come here, it seems that time has stopped here. It is not only an old colonial town with many original cobbled-stone streets from the 1500s , colonial windows and balconies with beautiful old buildings, but also with a variety of hotels and restaurants, customs and traditions, museums, art galleries, and night life. As we were driving from San Salvador to Suchitoto, our guide showed and named many different big and small mountains and volcanoes. First one was the San Salvador Volcano in the capital which last erupted in 1917. This is just one of total one hundred volcanoes of El Salvador. 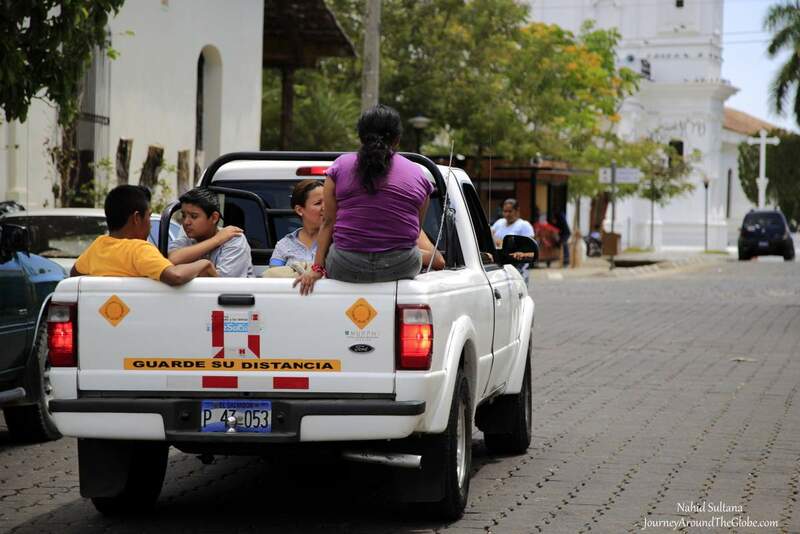 Luckily, Suchitoto is considered as one of the safest places in this country where dwellers don’t usually feel any earthquakes. Chalatenago Mountain range guards this part of El Salvador and it looks stunning with its peaks and curves. Many papaya, banana, coconut, and avocado trees along with bright colors of Bougainvillea flowers decorate the streets of Suchitoto. We hired an official tour-guide from viator.com for the Suchitoto day-trip from San Salvador. It was a private tour with a mini-van, a chauffeur, and a knowledgeable guide who spoke excellent English. TIME of TRAVEL: We went to Central America during the spring break in mid-March of 2015. 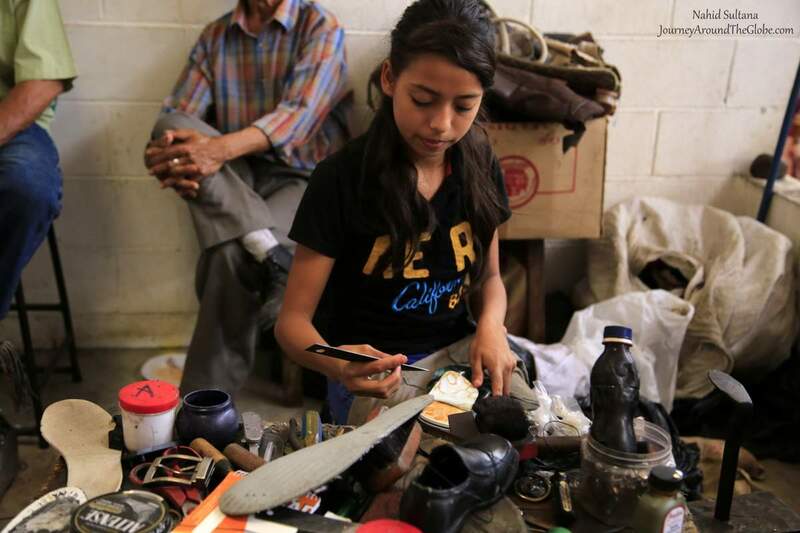 Our first stop was in El Salvador, then Panama, Costa Rica, and finally to Nicaragua. Within El Salvador, we spent a day in San Salvador, one day in historic town of Suchitoto, and last day in Joya de Ceren, visiting the Mayan ruins. 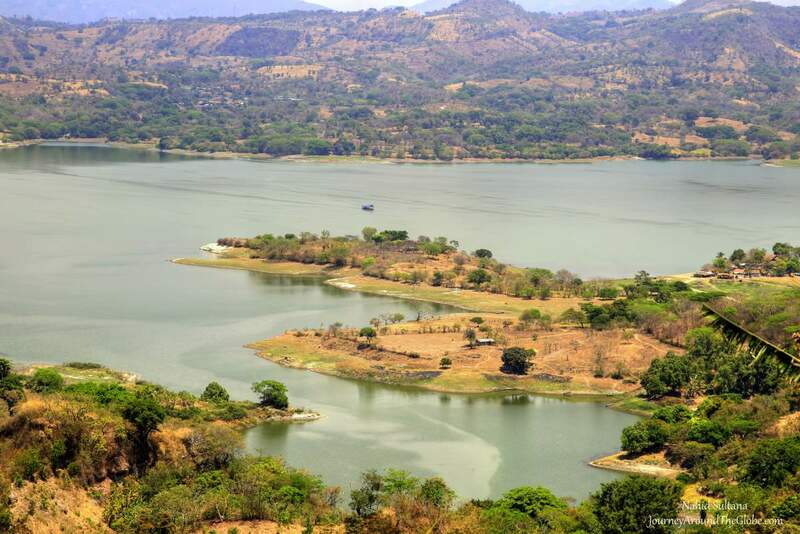 The climate is very tropical here and temperature in El Salvador is usually constant throughout the whole year. We were there during the dry season. You don’t want to come here in the monsoon when you can’t get around as much. It was in high 90s the day we visited Suchitoto…needed sunscreen, hats, sandals, liquids, and ice cream for the whole day. OUR HOTEL: Real InterContinental San Salvador was our hotel and base in El Salvador. We stayed here for 3 nights and everything about this hotel was above average. With courteous staffs, spacious rooms, grand breakfast buffet, and great location, this hotel was nothing less than A+ in every way. It was within walking distance from some fast food places and a mall. Although we booked all of our tours before arriving here, hotel can arrange daily tours with professional guides anytime for its guests. 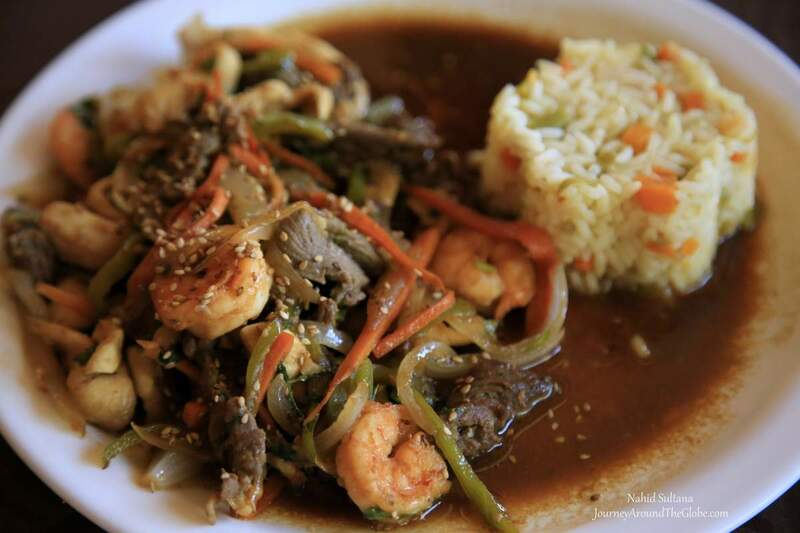 EATING and SHOPPING: Suchitoto has plenty of options for meals or drinks from different range of prices. Our guide advised us not to eat from street-side vendors because of hygienic reasons. He took us to a really nice place, called Los Almendros de San Lorenza. It’s a luxurious boutique hotel and restaurant owned by a French man and his partner. When you enter the restaurant, it may remind you of Andalusia with its inner-courtyard, fountain, and design orientation. You can sit outside but with that summer heat, we decided to sit inside with nice breeze from the air condition. This place has local and international choices in their menu, like pasta, kabab, sandwiches, salad, soups, seafood, and my most favorite one…traditional, local dishes. Make sure to order some juice with your meal too…they will be freshly prepared when you order. Overall, this place knows how to serve good food with great decorations. For shopping, Marcado Municipal de Suchitoto has lots of interesting local food items to buy. Our guide bought a type of cheese, called duro-blando for us to taste. It’s a Mexican cheese which was first introduced by the Spaniards few centuries ago. City center also has some other small stores selling local trinkets and artisans. PLACES WE’VE VISITED: We spent a whole day in Suchitoto and it was enough to learn about its history and enjoy the beauty. Though it has many things to do and see here, Suchitoto is a small town and can be covered on foot. 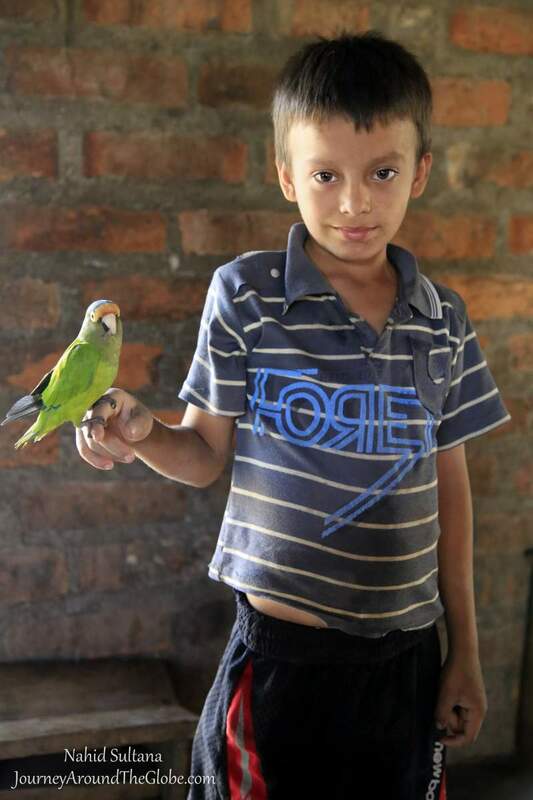 1) WASAPA: Our first stop of this tour even before arriving Suchitoto was a small village called Wasapa. Our guide wanted to introduce us to an ex-guerrilla who fought during the military dictatorship in 1980 – 1993. Apart from the political past and history, (which I wasn’t really interested about) I got a glimpse of the lifestyles of the villagers in this country. We met the ex-soldier’s family, saw his house, backyard farm animals, and simplicity of their lives. I went inside the kitchen when a lady was cooking (think the solder’s wife) to look at their old-fashioned clay-stove and oven…reminded me of the villagers of my country, Bangladesh. Life is so raw and organic here, you have to see it to believe it. 2) SANTA LUCIA CHURCH: After arriving Suchitoto, our driver dropped us with the guide at the city center, near Santa Lucia Church. 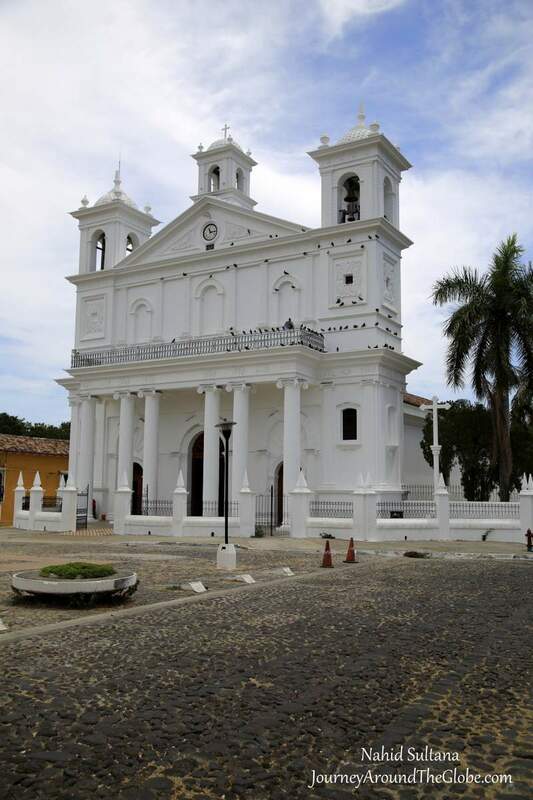 Most of the Central American churches look very similar to this one with white exterior and a pair of bell towers. Even in plain white, the building from 1836 looks bold and beautiful. The church still has its original floor and elegant wood interior with beautiful altar. It looked prettier with the decoration for a wedding that was going to take place that evening. 3) MARCADO MUNICIPAL de SUCHITOTO: This indoor area few minute from the church is the main market place for the locals. You will find many vendors selling fresh produces, local cheese, sweet treats, fish and meat, and lots of variety of household things here. You can find individual people offering services like alteration, shoe fixing, and other repairing services. After passing these family businesses, where even children were working, we came to the other side of the bazaar. 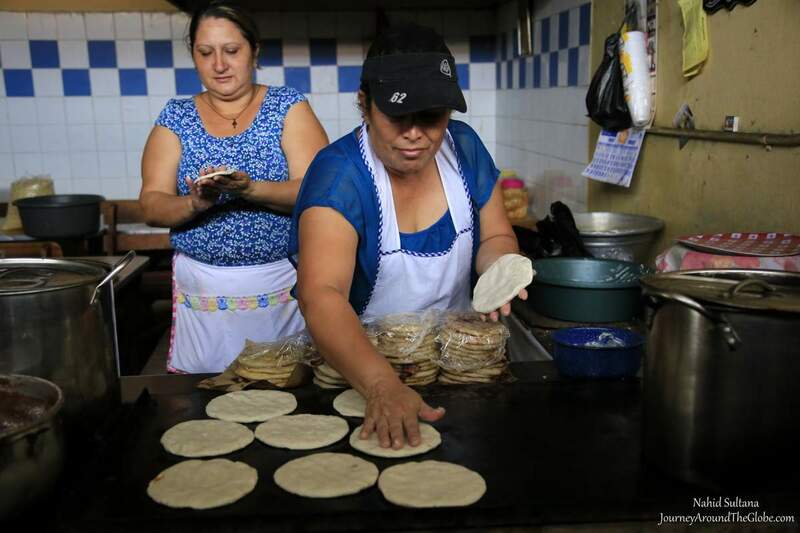 Here, the ladies were cooking and selling different types of local dishes in big batches, like tortillas, stuffed tortillas, and other snacks. Overall, Marcado Municipal de Suchitoto was a great place to capture some images of the locals…all I had to do was ask nicely and show them their picture after I took it. 4) VIEW of SUCHITLAN: Our guide took us to this fancy hotel and restaurant, “Posada Suchitlan” for few minutes to give us an overview of the beautiful lake, called Lago Suchitlan. It was absolutely a fantastic view from the balcony of that restaurant. Although we didn’t have lunch here, it would have been a perfect place to sit down, admire the lake, and enjoy some local delicacies. 5) CENTRO ARTE PARA LA PAZ: From the hotel “Posada Suchitlan” we walked another few minutes to Centro Arte Para La Paz. It was lunch time and the indoor exhibition was closed. We also couldn’t see the video they show on the history of Suchitoto. We spent few minutes just walking around the terrace surrounding the small garden with tropical plants. There were some sculptures and an inspiring canvas where many people left their peace messages for the visitors. 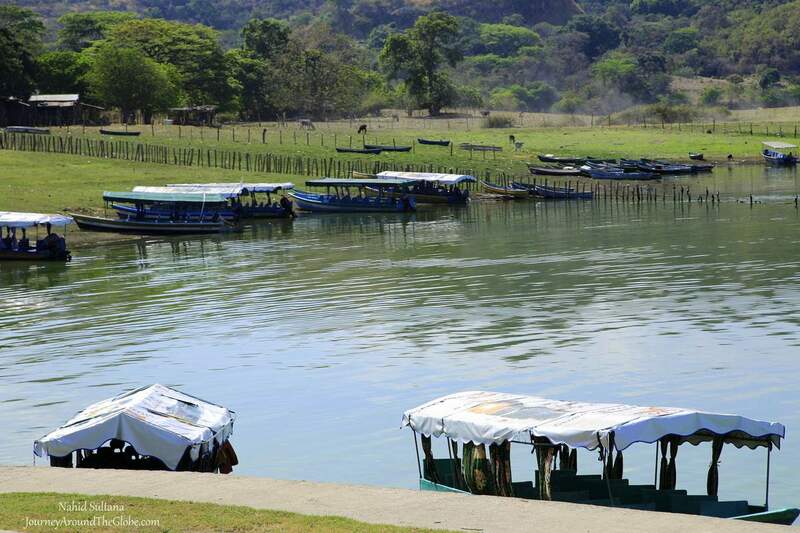 6) BOAT TOUR ON LAGO SUCHITLAN: This was the highlight of Suchitoto for me. At the end of the day while the sun was still out, our guide suggested us to take a boat tour on Lake Suchitlan. The minivan took us all the way down to the lake shore. There were few options for the boat ride. We chose to see the “Bird Island” which was $30 for 1 hour ride. This was the best way to enjoy the nature and get some fantastic clicks in my camera. 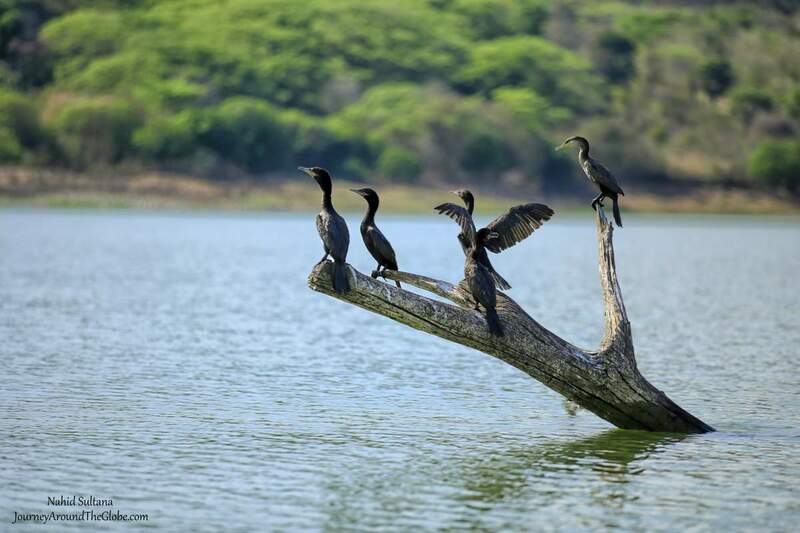 The kids loved seeing many different kinds of birds on our way to the island and on the island. We saw hundreds of birds, like pelican, osprey, some tropical, and some migrating birds. The day ended in a perfect way with this tour…couldn’t have been better than that.